Tip of the hat to Pete Wentz for the seed entry in this one. No, not that Pete Wentz, silly. I'll leave the proof up to the reader as to which one was the seed, you only have 68 entries to choose from. Oh, and say hello to the latest BEQ.com Fan o' the Moment: Thomas Warne of Bridport, England. Fun fact: Thom's neighbor is P. J. Harvey. 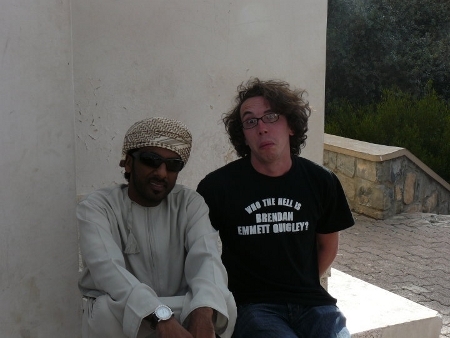 Anyway, Thom was vacationing in Oman, of all places, and stumbled upon my uncle. Or at least somebody who looks exactly like my uncle. He writes: "Not sure what the story is really, other than I just wanted to out do some of your super fans! The photos are all taken in Oman, which all sounds rather exotic and it was I suppose. BEQ in the Middle East! I missed a few great opportunities to get a camel photo as I didn't have the shirt on. Shame." Yeah, it was a shame indeed. But no matter, for his bravado, and formidable mugging-for-the-camera skills, he gets a copy of my "Diagramless" book. Everyone else: keep your photos and stories coming!